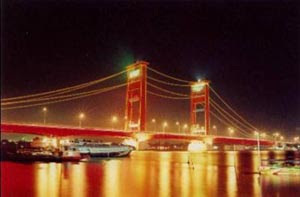 Musi river is one of the means of transportation connecting the city palembang between palembang ilir and palembang Ulu. Besides the river transportation trade musi also be used as a transportation crossing. Many means of transportation that is used in addition to the boat, speedboad, motor tempel, motor boats etc. An example of ships that have been used as a means of transportation and is the type of ships, "Steam Paddle boat"
Photos taken in the year 1935. Ships are also used long-serving transportation of goods in the Musi river and children's river into a remote hinterland South Sumatra. In Palembang, this ship called "Ship Marrie," or also known as the "Roda Lambung Ship." This two-ship, and with a rotor that rotates with the large rise of water spray, waves, foam and water that is very interesting attention. Musi River in the early 1950s it was felt, very flamboyant. Ampera bridge so that there is no traffic on the river it feels very crowded with boats, barge, ferry, speed boat, boat wheel side, and take a large ship and bring coal from Kertapati. Then the busy river traffic was seen starting from Tangga Buntung to Lais River. In front of Benteng Kuto Besak (Palembang people call "sea Benteng"), there are several ship terminal / ferry (in Palembang first called the "boom") as the boom is the port of Bari ferry crossing to the Musi (Ulu area), to ferry boom STANVAC (American oil companies with refinery facilities in the River Gerong), to ferry boom BPM (oil company with the English & Dutch refinery facilities in Plaju), boom PJKA special ferry that carries passengers from the train / rail station in Kertapati. In the "seaside Benteng" this base there are also boat crossing. Passenger traffic between the Ulu and Ilir Palembang served mainly by boat. as duku, duren, orange, pineapple and others. On each type of seasonal fruit base is very crowded boat with buyers, who throng to buy because the price is very cheap. Duku example sale and purchase not only using small cans (oil cans "Palmbom"), but also the size of oil cans, 20 liters. If the current season duren, duren scattered in piles everywhere. Some duren this also usually sold in the merchant base in the face of duren Jerambah (bridge) in the Coral Sekanak riverside near Kantor tap. Musi edge in the market at around 16 Ilir visible base of the boat to bring a variety of produce that comes from the "uluan" above, such as bananas, vegetables, fruits, and so forth. Some boats in this market area is a roofed awning boat sago, most ordinary boat, barge, and boat speed. At the river bank between Tangga Buntung (36 Ilir) until the end of the market area of 16 Ilir also seen a number of duplex house, the house edge on the float this Musi. Home of the raft is to use the boat with a smaller size for travel or find sustenance (fishing, menjala, trade, and others). 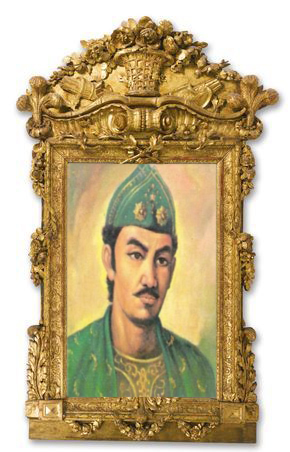 Given the Musi river at that time was intravenously movement of goods and passengers between the hinterland as a variety of produce, with Jakarta as the center of trade and processing of earth, the second edge in the Musi River in Palembang this area there are also warehouse-storage and processing factories. Processing factory which is a major manufacturer of rubber and timber processing / Sawmill (in Palembang first called "panglong"). Entertainment that awaited in-waiting every day a celebration of independence on August 17 also took place in the river that this is a trademark of Palembang. On that historic day commemoration, held a special race boat called "Bidar. Bidar is the length of the boat by rowing on the paddle around 20an that comes from groups bidar coming from various parts of the city Ulu and Ilir. At every club there are bidar large gong in order to encourage the paddle ... dung .... ... Dung. ... Dung. ... Dung. In the second bank, the boat-boat, barge, and small boats in order to encourage spectators to welcome the team favouritnya. Well, with all kinds of activities it can be busy boat traffic and boat in the Musi river at that time, color, romantisme, and the dynamics of life that takes place every day over the river that split the two cities of Palembang. In the middle of the river traffic that is the transport ships sail wheel stomach look with distinctive elegance. Size is approximately equal to barge but stratified. Sosoknya with a high, the size of the propeller, engine uapnya chimney, movement of its rotor, and the ripple cipratan water, and roads, which are relatively slow, this ship appears to have authority in the cloistered existence in the midst of various types of transportation facilities on the river of time that. Ship Wheel Lambung is a boat that serves transportation of goods and passengers to a number of areas in the hinterland of South Sumatra (local uluan). Ships sailing to this LEMATANG, Ogan, Komering, and Musirawas. With even the extent, part of the ship under water (drough) becomes low, and the boat more stable. This is what is technically possible ship made stratified. For transportation of river Musi river, and children in the area of river uluan, this draft that allow low sail into the outlying regions of the surface water becomes very low at the time of ebb and flow. Also be told in the article is that the era of golden ship wheel on the side Musi river began receding with the existence of railway network which was built in 1927. Transport goods and passengers and then switch to using the train. If the early 1950s on ships bound wheels still appear to operate, then in the 1950s Medio year is this boat is no longer visible in the river Musi. Ships stomach this type of wheel that is still used in the river Missisippi for tourism, because they have history and memories for a long and deep with this steamboat. There are various sizes with a steamboat on the river which is very famous.